Replacing missing teeth through use of dental implants is one of the best improvements in quality of life for patients a dentist can make. A skilled implant dentist can restore your smile by implanting any tooth which is missing. Done right, an implanted tooth should feel natural, give you a natural smile, and be structurally very strong. If you have missing teeth, decaying teeth which need to be replaced, or even need total tooth replacement with all on four or other tooth replacement procedures, then Aesthetic Dentistry of Arrowhead is a fantastic option. 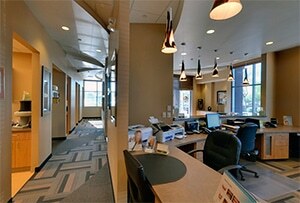 We are affordable, local, close to major freeways, located in the north Glendale Arrowhead district. When searching for a dentist office near me that does dental implants for missing teeth, our office is affordable, top rated, near the 85306, 85382, 85308, 85381 and surrounding areas. 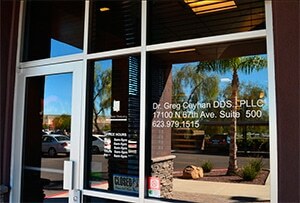 Google Map showing the location of our Dental Clinic in Glendale, AZ. 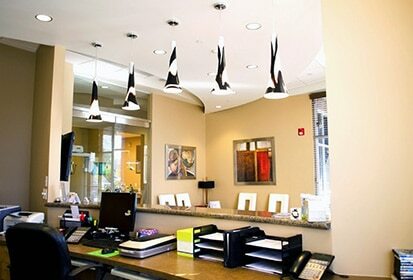 Every patient is different, but call our office to get information on current pricing on tooth implants. Also known as all on four or whole mouth implants, full dental implants can be preferable to dentures for many patients. 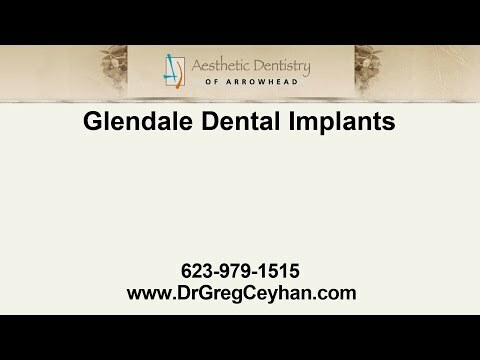 A top rated dentist on Google, Yelp and BBB, Dr Greg Ceyhan provides implant dentistry for Arrowhead and Glendale AZ patients. Dental implants are a tooth replacement procedure that produces natural looking and feeling replacements for missing teeth. Shaped like a screw, the dental implant itself is an artificial replacement for a tooth root, which is used to anchor replacement teeth. The implant is surgically inserted into the bone of your jaw to create a permanent and stable tooth base without needing rely on other teeth to support it. Once the implant has healed, a replacement tooth crown or bridge can be attached for a natural appearance. If you are losing most or all of the teeth in a jaw, your dentist may recommend implant supported dentures such as the All-On-Four implants. These treatment options provide a secure base for your dental appliance, placing four or more implants that your denture is permanently attached to, reducing the occurrence of slipping, and improving comfort in your mouth. Make an appointment with your dentist for a full evaluation of your mouth to see Glendale dental implants are a good fit for you. In general, successful implant placements require good overall health, good dental health, and sufficient bone structure in order to place the base of the implant. If you have already suffered significant bone loss due to the amount of time since your tooth was extracted, a bone graft may be required before an implant is feasible. The staff are very friendly and courteous! Why are dental implants a great alternative to dentures? They look great and are as easy to take care of as your own teeth would be. You will never deal with ill-fitting or painful dentures again. The implant fuses with your jaw bone and forms a permanent anchor for replacement teeth. Dental implants are a great option no matter if you have lost or are missing one tooth, several or even almost all of your teeth. All on four treatment options are available if you find yourself in need of a full mouth of implant teeth. The Arrowhead dental implant team and Dr. Greg Ceyhan have completed countless procedures giving patients back their confidence and beautiful smile. 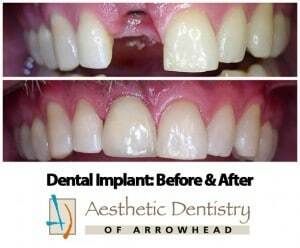 Arrowhead Dental Implants are a fantastic way to replace missing teeth. If you are suffering from tooth loss due to trauma, gum disease, or other dental problems, a dental implant can give you back a natural looking smile and help prevent oral health issues such as shifting or misaligned teeth, and bone loss. Dental implants are a great way to avoid these issue by replacing missing teeth. There are a variety of reasons for tooth loss, from trauma caused by an accident or injury, to disease of the gums, tooth, or even throughout the rest of your body. 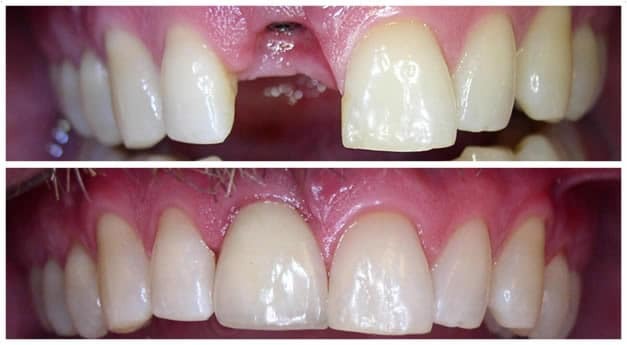 The holes in your smile due to lost teeth can damage self esteem and can create additional oral health problems such as bone loss and shifting or misaligned teeth. Glendale dental implants allow patients to lead confident, full and active lives by replacing missing teeth. Dental implants are a tooth replacement procedure that produces natural looking and feeling replacements for missing teeth. Shaped like a screw, the dental implant itself is an artificial replacement for a tooth root, which is used to anchor replacement teeth. The implant is surgically inserted into the bone of your jaw to create a permanent and stable tooth base without needing rely on other teeth to support it. Once the implant has healed, a replacement tooth crown or bridge can be attached for a natural appearance. 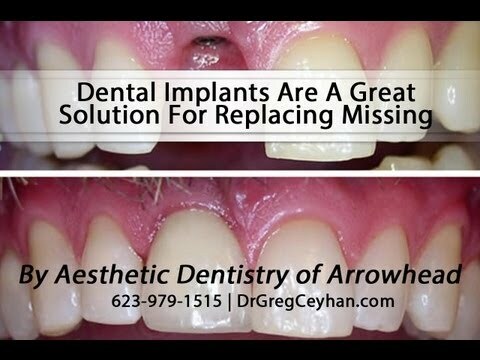 To find out about the dental implant services offered by Aesthetic Dentistry of Arrowhead and Dr. Greg Ceyhan, call 623-979-1515 or visit us on the web at drgregceyhan.com for more information. 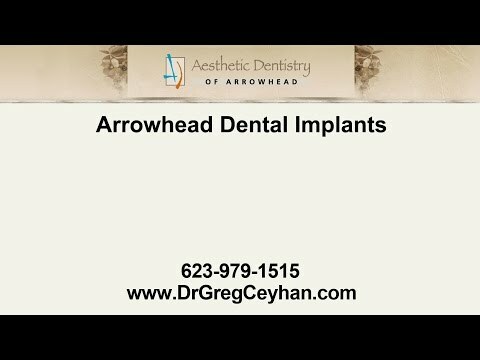 Dr. Greg Ceyhan with Aesthetic Dentistry of Arrowhead has years of experience in replacing missing teeth with the aid of dental implants. 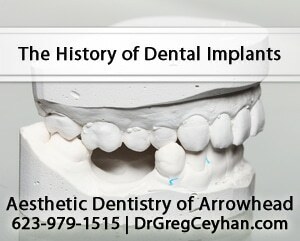 When working with his Arrowhead implant patients Dr. Ceyhan walks them through the entire process. 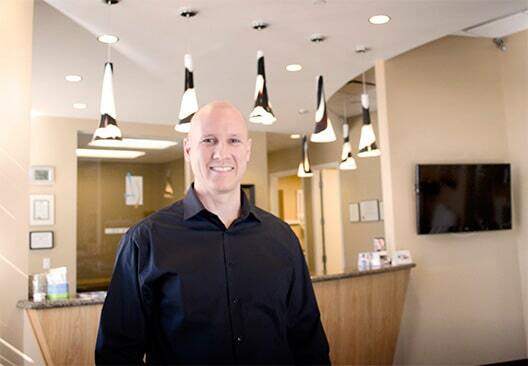 He is one of the best dentists in the Phoenix area and always furthers his education, staying abreast of the latest dental findings and medical procedures. By learning new techniques, he is able to provide top cosmetic and dental implant treatments to all of his patients. s.
When one or more teeth are missing, the remaining teeth may shift, the gum line can recede and it can impact the health of the entire mouth and even change the appearance of the face. By replacing the missing teeth with a dental implant, those negative effects can be avoided. Once the implant has healed properly it serves as an anchor for replacement teeth and the replacement tooth, bridge or crown can be attached. In short, a dental implant is an artificial root for replacement teeth. Unlike removable dentures, North Phoenix dental implants can be treated just like natural teeth. Maintain normal oral health care standards by brushing and flossing twice a day and make sure you schedule your routine checkups at least twice a year or as frequently as your dentist recommends. I Only Lost One Tooth, Do I Really Need To Replace It? Not only can the gap caused by the loss of a tooth cause shattering damage to your self-confidence and self-image, but even a single lost tooth can cause additional oral health problems. The gums and bone normally anchored to your tooth can recede, causing other teeth to shift and even potentially changing the shape of your jaw and appearance of your face over time. Oral care can also become a problem when there are gaps in your teeth, creating breeding grounds for bacteria and oral disease. Losing just one tooth can have serious effects to your self esteem and health. Not only will it be very noticeable when you smile, but teeth are anchors for bones and gums and if the tooth is gone, they will recede. This can lead to the shifting of other teeth and ultimately may change the shape of your jaw or even your face. Additionally, it can make oral and dental care quite challenging as gaps may start to be breeding grounds for bacteria and subsequent infection and tooth loss may occur. It is best to consult your Arrowhead dental implant dentist as soon as you lose a tooth or are dealing with oral trauma to counteract any problems that may arise or have arisen already. If you have been lacking confidence or been feeling self-conscious about missing teeth or a misshapen jaw line, a dental implant from Aesthetic Dentistry of Arrowhead might be the perfect solution for you. We invite you to meet with our experienced cosmetic dentist Dr. Ceyhan to discuss if and which type of dental implant might be right for you. 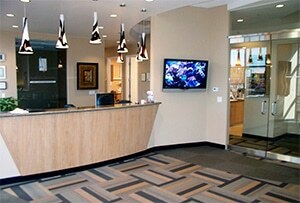 He can evaluate your oral structure, dental and overall health to see if you are a good candidate. If you have suffered bone loss in your jaw already, a bone graft may be required. If you have been curious about Arrowhead braces or considered getting a smile makeover, contact us today. Dr. Greg Ceyhan is one of the best aesthetic dentists around and will meet with you to discuss your best options during a free initial consultation. We can determine the length of your treatment, contact your dental insurance provider, and discuss possible financing options. Get ready to smile your best smile yet. Contact us today to learn more. Once the healing is complete after your oral surgery to place one or more dental implants, and the bone in your jaw has had a chance to bond with the implant in a process known as osseointegration, you will need a permanent restoration to replace your missing tooth. At this point the gum has been allowed to heal over the implant for extra protection during healing, but your North Phoenix cosmetic dentist will make an incision to expose the implant post. Next, a small metal pole called an “abutment” is attached to the implant, this will be the part that is connected to your new false tooth. Finally, your permanent dental restoration is bonded to the abutment, making a permanent tooth that looks and acts like a real tooth. There are several different options for your new restoration, all of which are custom fabricated to fit perfectly in your mouth. Glendale dental crowns are caps that are cemented directly to the implant’s abutment. Each implant will have its own separate crown. You can get crowns made of metals such as gold alloy crowns, ceramic, or the most popular option are porcelain crowns. Fixed bridges can replace one tooth, or a series of several teeth in a row and gain their name because they are attached to healthy teeth or implants on either side of the missing teeth. If you have four teeth in a row that are extracted, a fixed bridge would allow you to have four replacements sit on only two implants, one on each side of the gap. Another option is overdentures, a denture that is held in place with implants. This removable option is great for those who need more hold and security from their full or partial denture. The last option is a permanent full-jaw replacement prosthetic, resting on just four implants. These “permanent dentures” are frequently marketed under terms such as Teeth-in-a-Day™ or All-on-4® treatment concepts. After your new restorations have been placed, no matter which type you choose, they will look and feel like real teeth. You will be able to smile freely, chew hard foods without having to worry about restricting your diet, and speak normally. You should feel confident in your new smile, and know that dental implants have an extremely high success rate, with a total timeline from your first appointment to the placement for your permanent restoration of about three to six months. While many Peoria dental implant restorations need no extra care beyond regular brushing, flossing and preventative checkups, be sure to speak with your dentist to find out if your restoration requires any specific care. Dental implants, placed by a Peoria cosmetic dentist like Dr. Ceyhan, are permanent tooth replacements that don’t need special care or removal and are an excellent alternative to removable dentures. Surgically implanted directly into the jawbone, the metal or ceramic material of the implant fuses with your bone in a process known as “osseointegration”, creating a stable anchor for your new teeth. It takes between three and six months for your implant to heal, and at this point your dentist can complete your restoration by placing the permanent crown. Implants can be placed for a single tooth, several teeth in a row with a bridge, or if most or all of your teeth on a jaw are unsalvageable, you should speak to your North Phoenix dentist about full jaw replacement such as All-On-Four treatment options. Hi, I’m Dr. Greg Ceyhan. 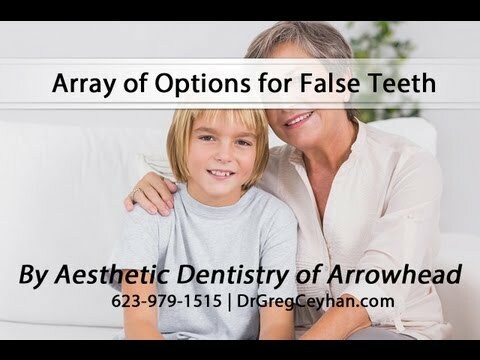 My practice name is Aesthetic Dentistry of Arrowhead. We’re located here in Glendale, Arizona, in the Arrowhead area. 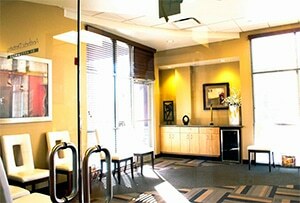 My field of practice is specifically cosmetic dentistry and general dentistry. Generally speaking, implants are a solution to replacing missing teeth. So, patients who are missing one tooth, it’s a fantastic solution because it gives you something that looks, feels, and acts the most like a natural tooth. You could floss it normally, brush it normally, and it looks like an actual tooth. If you’re missing a whole mouth full of teeth and you’ve basically been suffering with a denture for many years. Implants can replace a whole mouth full of teeth as well and you don’t have to take it in and out like you would a denture. So, that’s an excellent solution to patients who don’t have any teeth whatsoever. 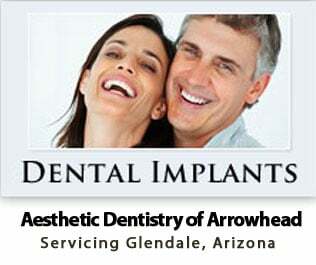 The two most common restorations to fill gaps left by missing teeth in Glendale, AZ are dentures, and dental implants. When making your choice, it’s important to consider the differences between these two options, which can include factors like cost, durability, comfort, and your personal confidence level. Both dentures and implants are made to last a long time, but something to be aware of is that dentures do not prevent your mouth from changing over time. After tooth extraction or loss, your gums and jaw bone may shrink, changing the shape of your jaw and face altering your bite, and creating wear and tear on the chewing surface of the dentures, eventually requiring refitting or replacement of your dentures. Peoria dental implants are fused to your jaw and prevent these alterations in your mouth. It is recommended your have your dentures relined or rebased every five to seven years. For dental implants, the actual implant base will likely last the rest of your life. The visible replacement tooth crown is rated for ten to fifteen years, but can last longer depending on the location in your mouth and the strain required for chewing. The shrinkage of the gum tissues and jaw bone can cause the dentures to become loose, allowing for slippage, gum irritation, and mouth sores. Most North Phoenix denture wearers that do not have their removable dentures regularly serviced by a dentist experience discomfort at some point due to these factors. Dental adhesive can be used to help keep the dentures in place, but these can be messy and a hassle to use and clean up. Upper dentures also frequently affect the taste of food because they cover the upper palate, and can cause diet restrictions because they do not offer a strong bite force. In contrast dental implants are permanent, do not need to be fit or removed, and offer the same force for biting as natural teeth. However, they require a lengthy healing period to fuse the implant base to your jaw before your replacement teeth can be installed. If you are interested in a full jaw set of new teeth, but want to get them quickly, Teeth In A Day™ implant treatment may be a better option for you than individual dental implants. At first glance, the quickly and easily fabricated dentures are far less expensive than dental implants, but dentures have much more long-term costs associated with them. With the shrinkage of gums and jaw bone, additional trips to the dentist are required for adjustments and even replacements. 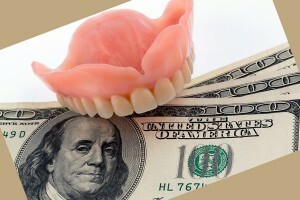 Related costs can include dental adhesives, and special denture cleaning tools and products. Dental implants cost more upfront, but require no adjustments replacements, or additional trips to the dentist’s chair beyond your regularly scheduled dental cleanings. Even if your dental crown reaches the end of its lifespan or breaks, the implant itself remains in place, and your new crown can be placed at minimal cost and fuss. Dentures can be frustrating, and even embarrassing at times. With a tendency to slip and move around, they can restrict your ability to eat certain types of food, and can impair your ability to speak as the shift on your jaw. 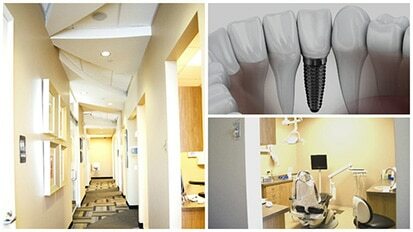 Properly placed implants are permanent, stable and fully functional as a natural tooth. Dental implants are a great alternative to dentures and dental bridges, creating a permanent anchor for porcelain crowns as replacement teeth. Getting dental implants placed is a surgical procedure that can be performed at your Peoria dentist office under a local anesthetic and is an outpatient procedure. On your first appointment, your dentist will evaluate your overall health, teeth, gums, and the amount of bone in the location of the missing tooth or teeth. If your teeth were extracted long enough ago that your jaw bone tissue has shrunk too far for a dental implant to be feasible, your dentist will go over options with you. One possibility may be a bone graft, which will stimulate bone production at that site, making a dental implant possible again in the future. Once you have decided on getting a Glendale dental implant, the first surgery will be burying the implant underneath the gum and into the bone. This will protect the implant while it heals. Over the next few months, the implant will be allowed to heal and bond to the surrounding bone in a process called osseointegration. This allows for a permanent and secure anchor for when your replacement tooth is added, giving it just as much stability and bite force as any of your natural teeth. Your Peoria dental implant dentist may provide your with a temporary tooth replacement to wear over the implant site during this healing period. Once the implant has successfully integrated with your jaw, the dentist will attach the abutment through the gum into the implant. The abutment is a metal post that sticks out of the gum and is what your replacement crown will be attached to. The gum will then be allowed to heal around the abutment, creating a collar through which your dentist can access the implant. Once your mouth has healed enough that the implant no longer needs to be protected from the forces caused by chewing, your prosthetic tooth can be connected. Dental implant prosthetics are usually porcelain crowns which are formed in a lab and then bonded to the abutment. If you are replacing most of the teeth in either your upper or lower jaw, All-On-Four denture alternatives can be a cheaper option than getting a dental implant for each tooth. How to Determine Whether You Are Good Candidate for North Phoenix Dental Implants Dental Implants – Say Goodbye to Bad Teeth!